Comparative study of physical therapy interventions for musculoskeletal disorders. Dr. Ganiyu received a Bachelor’s degree in Medical Rehabilitation (Physical Therapy track) from the Obafemi Awolowo University, Nigeria in 1992. He received a Manual Physical Therapy Certification in 2001 and completed a Master of Health Sciences degree with orthopaedic focus from the University of St. Augustine for Health Sciences (USA) in 2003. Having demonstrated competence in specialized knowledge and advanced clinical proficiency in orthopaedic physical therapy, he was granted board certification as an Orthopaedic Clinical Specialist (OCS) by the American Board of Physical Therapy Specialties in 2007. He completed his clinical Doctorate in Physical Therapy at Evidence in Motion Institute of Health Professions in 2012. 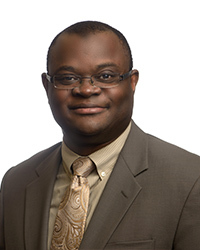 Prior to joining the USA, Dr. Ganiyu was the director and owner of Spine & Orthopedic Physical Therapy, an outpatient clinic located in Beloit Wisconsin for twelve years. He is currently a full-time core faculty member at the Florida campus of the University of St. Augustine for Health Sciences, and instruct in the entry-level Doctor of Physical Therapy program. Dr. Ganiyu has presented at multiple professional conferences and meetings within the United States and overseas. He is a visiting lecturer to two physical therapy programs in Nigeria. He developed and taught continuing education (CE) courses on lumbo-pelvic-hip complex, cervical spine, and lower extremities. Through his CE courses organized by the International Continuing Education Network (ICEN), Dr. Ganiyu has been instrumental to the training and certification of physiotherapists who are recognized and credentialed as Spine Physiotherapists by the Medical Rehabilitation Therapists (Registration) Board of Nigeria. He was recently appointed by the American Board Physical Therapy Specialties (ABPTS) as an item writer functioning within Specialist Academy of Content Experts (SACE) for specialties board examinations in physical therapy.